Once known as Great Meadow, this town was first granted in 1735 by Governor Jonathan Belcher of Massachusetts as Number 2, second in a line of Connecticut River fort towns designed to protect the colonies from Indian attack. This part of the river was a favorite Indian campsite, and the settlers who came beginning in 1741 were several times victims of attack. 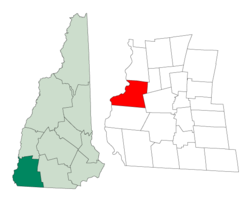 When the border between Massachusetts and the Province of New Hampshire was fixed (with Number 2 on the New Hampshire side), the town was regranted in 1752 by Governor Benning Wentworth as Westmoreland, named for John Fane, 7th Earl of Westmorland. Westmoreland is served by state routes 12 and 63. As of the census of 2000, there were 1,747 people, 576 households, and 445 families residing in the town. The population density was 48.7 people per square mile (18.8/km²). There were 618 housing units at an average density of 17.2 per square mile (6.7/km²). The racial makeup of the town was 97.82% White, 0.34% African American, 0.29% Native American, 0.80% Asian, 0.34% from other races, and 0.40% from two or more races. Hispanic or Latino of any race were 0.92% of the population. There were 576 households out of which 31.6% had children under the age of 18 living with them, 69.6% were married couples living together, 3.8% had a female householder with no husband present, and 22.7% were non-families. 17.4% of all households were made up of individuals and 7.8% had someone living alone who was 65 years of age or older. The average household size was 2.57 and the average family size was 2.92. In the town, the population was spread out with 19.9% under the age of 18, 6.6% from 18 to 24, 26.8% from 25 to 44, 27.4% from 45 to 64, and 19.3% who were 65 years of age or older. The median age was 43 years. For every 100 females, there were 97.6 males. For every 100 females age 18 and over, there were 99.6 males. The median income for a household in the town was $55,875, and the median income for a family was $62,857. Males had a median income of $40,515 versus $28,456 for females. The per capita income for the town was $24,488. About 0.4% of families and 2.5% of the population were below the poverty line, including none of those under age 18 and 5.4% of those age 65 or over. ^ Coolidge, Austin J.; John B. Mansfield (1859). A History and Description of New England. Boston, Massachusetts. p. 677. Wikivoyage has a travel guide for Westmoreland (New Hampshire).